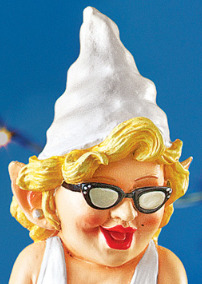 The Dancing Diva wears a flirty white dress, red lipstick and black sunglasses. She has a fun hand-painted details. Resin. Diva is 5 1/2" L x 5 1/4" W x and 11 3/4" H.
I accept Pay Pal, Money Orders and Serve. Cash On your own,If any one thing in my booth is wrong or upsetting to you, please let me know. If necessary I can and will remove the item.If you think I went overboard on pricing, let me know that too. I am able to change anything and everything. If you don't like me, I can fix that too. So whatever upsets you I am sure we can fix it.